Superior provides a great selection of shower and restroom trailers perfect for your next Ohio event. Whether your event lasts for a single day, or you need a trailer for an entire year, Superior restroom and shower trailers are available whenever and wherever you need them. 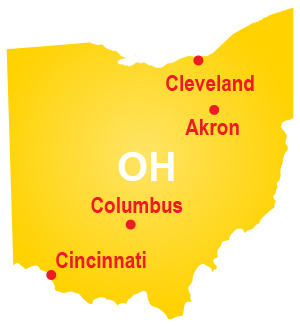 In fact, some of our customers have the most recognizable names in the state, including the Cleveland Browns First Energy Stadium, Stan Hywet Hall and the 2016 Republican National Convention. We’ve also provided our shower and toilet rentals for Ohio fundraisers, fairs, weddings and even seasonal events like haunted houses. Each of our shower trailers are equipped with high capacity water tanks, providing each event and location with hours of hot water, even when no outside water source is available. With private stalls, sinks, large mirrors and electrical outlets, our shower trailers offer every convenience. All Superior restroom trailers are clean and well maintained. Each model offers its own set of features, from handicap accessibility, to wood grain floors, to heating and air-conditioning. Whether your event has 50 or 5,000 guests, provide the modern conveniences of a traditional bathroom by renting one of our restroom trailers. You can find restroom & shower trailers from Superior throughout Ohio, including cities like Akron, Canton, Cincinnati, Sandusky, Cleveland and Columbus as well as in Columbiana County, Carroll County and Harrison County. Contact us to request a quote.